When my mannequin’s head popped off and rolled onto the floor, Marie Antoinette-style, and I hit its neck repeatedly on the table in an attempt to screw the head back on–thereby horrifying the infant CPR teacher, embarrassing Scott, and possibly causing Child Protective Services to preemptively open a file–it became clear that we need to stop taking classes and just have this baby already. Our timing is good because he’s due next Tuesday. Next Tuesday! I’ve got all the signs of being nine months pregnant–I waddle like a penguin, I burp like I’ve just chugged a beer, I eat more Nutella in a week than a French teenager does in a year–but the actual baby part doesn’t compute. When I walk past the nursery we set up, I think to myself, “that’s a baby’s room,” as if I’m looking at something that’s not really relevant to my life, like an Audi dealership or a golf course. I cook. I make lentil minestrone, roasted butternut squash, carrot cake, meatloaf—and I freeze it for later. For after the baby comes. Peel the butternut squash with a vegetable peeler. Cut it down the middle lengthwise if you can, otherwise cut it in half and then lengthwise. Scoop the seeds out with a soup spoon and discard. Cut the squash into 1″ or 1.5″ cubes and place in a large bowl. If you’re using olive oil, drizzle it over the squash. If you’re using coconut oil, heat the oil and drizzle it over the squash. (Use 2 liquid Tablespoons, not 2 solid Tablespoons of coconut oil.) Toss the squash with the brown sugar, cinnamon, salt, and cumin (if using) until it’s evenly coated. Spread the squash in a thin layer onto a baking sheet or two (you can use however many sheets you want, but just make sure that the pan isn’t crowded, otherwise the squash will sort of steam instead of caramelize and brown.) Roast for about 40 minutes, stirring part-way through, until the squash is caramelized and tender when pierced with a fork. 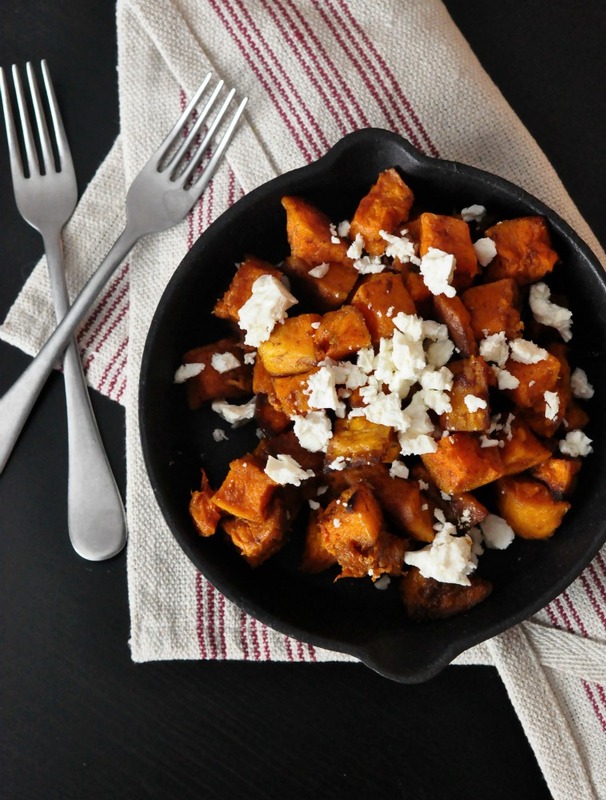 Transfer the squash to a bowl and, if serving immediately, toss with feta to taste. If you’re not serving it immediately, wait to add the feta. Thunder hasn’t been sleeping well lately, what with all the irksome nighttime burping. Ha! You are hilarious! How exciting, a new baby! Your goldfish brain will come alive as soon as it enters your world. The only thing I remember thinking at that moment is, “Holy crap, THAT’S a baby!” Lugging it around for 9 months isn’t really enough until it’s right there looking at you. Aieee! I can’t wait to see what he looks like. When I see my friends’ newborns, I can’t believe that my baby looks kind of like they do, just inside. It’s going to be such a shock (in a good way). I’m sending you and your family wishes for good health and happiness. Also, I’ll bet that you won’t actually remember this week at all. The new normal will be- nothing is normal ever again. Ah, this sounds very wise! Lotsa luck, you guys! I’m sure you will have a beautiful baby. If you think you know what love is . . . you’re wrong. Just wait! Barb, I can’t wait to send you a picture of him in the bassinet you loaned us! Katherine, you and Scott are going to WIN this baby thing. You have *exactly* the sense of humor necessary for successful parenting. (I wish humor were more helpful with bar exams, but I know you’ll ace that, too.) Sending you Happy Mom Vibes from the west coast! Thank you, Jennifer! I’ve been wishing I were on the west coast this week. We have so much snow. I know it’s good to walk around at this point but you could not pay me enough to waddle around in 16 degree weather! I couldn’t do it. Any of it. You’re my idol. My gassy idol. Honestly, between Thunder’s nightly farts and my constant burping, I’m surprised the bed hasn’t lifted off the floor and floated out into the street. Oh, I’m so glad you posted. I’ve had fleeting thoughts about you (Are they with or without spousling? Are the dogs jealous or protective? Are they subjected to neighborhood casseroles because BABY instead of cooking?) Can’t wait to hear all about it when you come up for air. Spousling!!! I love it! So, Thunder has taken a keen interest in my belly lately. She sniffs it whenever she can. At first I thought “she knows something’s up!” But I might be giving her too much credit. Basketballs are her favorite thing in the world. She might just think I’m hiding one in there. Seymour is oblivious and still tries to sit his 60-lb. self in my lap, bump be damned! As for food, I have a friend with a newborn who lives in rural Washington state where there is NO delivery. Like, not even pizza. I don’t know how they’re managing it. Thankfully, we live a few blocks from a Domino’s and I love their pan pizza with pepperoni. I see your burp and raise you one. . . uh. . . hmm. Probably just another burp. The most terrifying thing that happened to me during my first pregnancy (after we got past the scare in the beginning) was that somebody gave me the cutest little green hat that ever existed and my brain suddenly said,”Holy Crap! There’s going to be a baby in that thing in a few months!” My friend was confused as it’s a little “no duh” but up until then, I’d been so concerned with keeping that dood inside me to grow, it hadn’t really occurred to me that one day soon he’d actually come *out. * And then there’d be a baby that wore ridiculously cute green hats and did other terrifying baby things. Fortunately, I got over it before the baby shower or I might have gone into some sort of coma or something. Oh man, what a cool memory. Do you still have the hat? My mom knit us a baby hat with what must have been the teeniest knitting needles. It’s white with little flecks of color and a couple little knitted swirly things on the top, like ribbon when it’s curled. It’s SO freaking adorable. It’s in the hospital bag so that he can wear it home. I had a crazy “oh wow–this is really going to happen” moment today, actually. I had a doctor’s appointment and it turns out I’m pretty effaced and a little dilated. It’ll still probably take forever, but the fact that my body is actually en route BLEW MY MIND. Much luck with labor and delivery – enjoy having the baby ALL TO YOURSELF until then. Once he comes out, other people will rudely want to interact with him too. But there’s some truth in that, I bet. Even though he’s not here yet, I’m used to never being without him, in a way. It might be strange to have him out in the world! So good to hear from you. Good luck on your big adventure! Thank you, my friend! It had been too long since we corresponded. Feels good to be back saying hello. Aw man, I know you’re right. I bet I’ll go pretty late. My doctor said that after 41 weeks we’ll meet to “talk about getting him out.” I would love not to be induced so hopefully we can push that date out a little as long as he’s doing okay in there. Tell us about your new grandson! What’s his name? How was your daughter’s labor? (I don’t mean to pry, though.) So exciting!! How she doing now? Ah, I see. Glad to hear that even if it was long, it went okay. Do they live near you? This is the first grandchild for my parents, and the third for Scott’s. (His sister has 2 boys.) My mom has been looking forward to grandbabies for a long time (I’m 36) and then this past year, I got pregnant and so did my brother’s wife! She’s due this summer. So my mom is flying high, I think. I’m sitting here at my desk reading your post while pumping for my 3 1/2 month old…who I often still affectionately call “Baby” instead of his name, because it often doesn’t seem possible that he is really here! Really mine! Really his own adorable little self! There are many things that were not what I expected (like breastfeeding…no one tells you how hard it really is for most people! ), and you can never be fully prepared, but with a freezer full of food I think you’ll be way ahead of most people…and you should be able to steal AT LEAST another week’s worth of diapers while you are at the hospital (I found a hospital diaper still in the diaper bag the other day!). Emilie! I wish I could see a picture of your baby! What DID you name him? I have heard that breastfeeding is hard and also kind of painful and…mostly hard. I have a friend who just had a baby who wants to eat every hour and a half. She barely sleeps. I just hope my milk comes in–it sounds stressful if it doesn’t. (Not that I’d feel like a failure if I had to use formula for a week or two if it was late, but still.) I got a Medela pump through my insurance and it looks…daunting. Do you have any suggestions for the first few months, in general? Anything that made it easier? As for diapers and whatnot, I am TOTALLY stashing the free hospital stuff in my bag and then requesting more. I hear the undies and the cold packs are amazing and that I’ll want as many as I can get! Wait a moment – I’m behind. Tuesday, as in yesterday? I bet it will be another week. But I’m a bad gambler so I bet… That the sun will come out tomorrow! Oh, I wish. Tuesday as in the 10th. I bet I’ll go a week after that, what with it being the first baby and all. I’m a bad gambler, too, though. When we went to Kentucky for Thanksgiving, we went to the races at Churchill Downs. I bet on so many losing horses that day, I cannot tell you. (This is why I make mostly $2 bets.) At one point my 1st, 2nd, and 3rd place bets came in 8th, 9th and 10th, respectively, which I believe deserves SOME kind of prize. Babies love farting and burping, and when heads fall off of things. You’re going to be awesome at this. Aw, thanks Sue Ellen! It WAS a fast nine months once we got through the first 3 or 4. The rest just flew by, which is saying a lot since winter here seems to drag on for forever! Thank you for sharing your journey with us in your beautiful way. I’m on the edge of my seat. Best wishes!! Gah, me too, Devon! Due date is tomorrow. Whoot! Thanks for the very kind words. Mmmmm… peanut butter on ice cream. My go-to snackish dessert for years was vanilla frozen yogurt with peanut butter sauce drizzled on top with Special K cereal over top of that. OMG. Yuuuum. I used to put Golden Grahams on vanilla frozen yogurt. DEEEEElicious, I tell you. Hi Janie! Congratulations! I love the name Isabel Grace. Beautiful. How did it go? If you feel like telling (ha–as if you don’t have better things to do) I totally want to hear your birth story. Thank you! I named her after my mother. 🙂 Since you have already had your very own birth experience, I can now tell you that my labor and delivery lasted over 48 hours and ended up with blood transfusions and surgery. The very beautiful upside is that we are both here and healthy. 🙂 Congrats on your sweet baby boy! YARGH IT’S SO SOON! Can’t wait to see his wee squashy face. And maybe post you something knitted, though it might not be up to your mum’s standards – as with a lot of things in life. It’s so sooooooon! His face BETTER be squashy because if it’s not squashy that means he’s not trying hard enough to FIT through the. . . you know–the parts he needs to fit through in order to get the hell out of there. I love knitting and should take it up again. I’m not good at it, and can basically only knit when I’m around my mom, so that I can inevitably hand the mess to her every 5 minutes and ask her to figure out where I made a mistake and undo it. Just found your blog and absolutely love it! I think I might have an unhealthy obsession with Thunder already – those ears!! Ahhh! The cuteness is almost too much for me! Hi! I’m so glad you found your way here, and thanks for leaving a kind note. Yeah, Thunder is a dream. 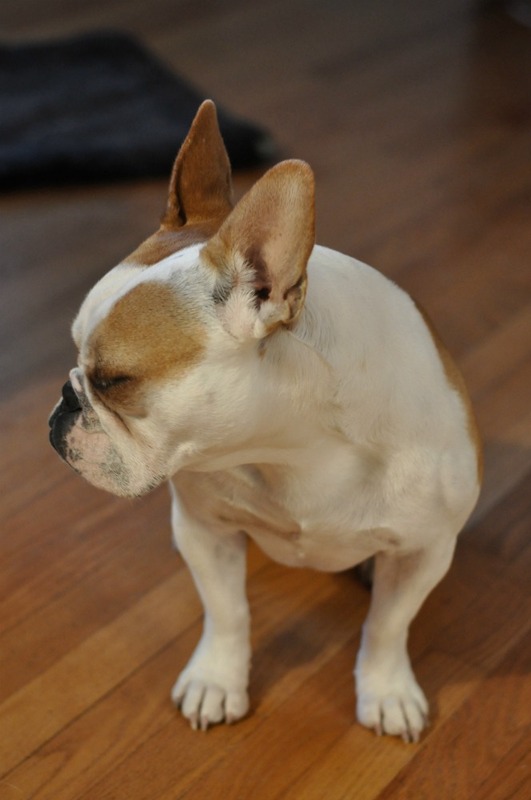 She’s half French and half English bulldog. Her birthday is tomorrow, actually–she’ll be 4! She can jump SO high and she loves tugging and apples and cheese and cuddling. I still can’t believe she’s mine. It seems too good to be true. I’ve already gotten requests to let various neighbors know when he arrives, and I think you’re right—you may very well go another week past D (as in Due)-Day! My first was 10 days “late”, but I think they just come when they are good and ready. Please call/knock/email if you need anything in the interim—so exciting! Oh, this is beautiful. The calm before the magnificent storm! I’m getting so impatient over here! Did you go past your due date with any of your little ones, or get induced? I’m 4 days over. My doctor wanted to induce this coming Tues but I wasn’t thrilled about that so we compromised on next Fri (+10 days) if he hasn’t arrived before that. I’m late to this and possibly the little man has already arrived – so excited for you!!! Hang in there… Ben was 10 days past due date…no induction, successful VBAC, has taken his time with everything ever since. 🙂 Hope you’re feeling well and are not snowed in! Just stopped by to see if we have a new addition to the family yet. Looks like he’s very happy where he is. thankyouverymuch. Wishing you a speedy delivery and a healthy baby boy! And, for your sake, soon. Hi Stacy! Alas, NOPE. I feel fine, but it’s weird ramping up emotionally and then….waiting. And waiting. Thankfully, I’m reading a good book: All The Light We Cannot See. It’s keeping me occupied (though I still wonder every 4 seconds if I’ll go into labor ever or if I’ll still be here next Friday and have to be induced). Just looked up All The Light We Cannot See and it sounds interesting. We used to go to St. Malo at least once a year several years ago. It’s a cool, historic place, a huge walled city where modern folks still work and live. I may have to buy the book. Stacy, I would be happy to send the book to you if you like! (I’m almost done.) I think that if you’ve spent time in Saint Malo you will love it. Just email me your address (eggtonmail@gmail.com). Well, aren’t you the sweetest! I’ll be in the US for my daughter’s spring break next month and I’d love to read it, if you are ready to part with it. I’ll send you the address by email. listen: i know you’re busy right at this second having your mind blown by a days-old human, so congrats! THIS BABY WHICH YOU SPEAK OF IS HERE! and i hope you’re loving every minute of it, and i’m happy you cooked ahead because nothing is getting done for a nice, long while. sleep when the baby does: not forever, but give yourself like, a few weeks of that and it’ll do you a world of good. Also watching movies at 2 am in between feedings when it seems super silly to go back to sleep? feels good.